For me, the best part of a cold and rainy day is when the craving for soup strikes. I’m not sure which satisfies me more…the making of the soup or the eating of the soup – I just know I love it! Last weekend, while at the farmers market, I spied some Turtle beans and they just screamed at me to be made into a delicious soup! 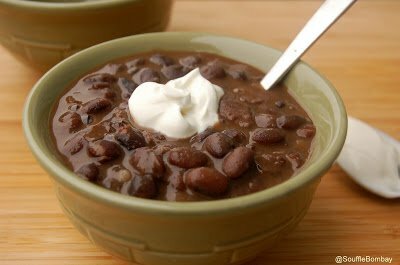 I love a good, spicy, black bean soup…don’t you? Funny how I don’t think I ever thought about putting THAT into my mouth until I was about 30. Boy was I wrong! Now you know…the thing with making a good black bean soup is buying dried beans and allowing them to soak overnight – so this isn’t one of those soups you can instantly whip up. BUT on a Friday night or a Saturday – throwing the beans in a pot of water that needs no attention and letting them soak all night long, sets you up for soup success the following day 🙂 Plus, getting a super dose of protein, fiber and iron never hurts! Turtle beans are just like regular black beans…just a little smaller. Feel free to use either in your soup. I love the bacony, beany, taste of this! I use beef broth instead of the traditional chicken broth for a deeper flavor, enjoy! Rinse your beans in a colander, place them in a large pot and cover with water plus an additional 2-3 inches of water. Set on your cool stove or counter and allow them to soak overnight or for at least 8-10 hours. Drain your beans and set aside. In your large pot, saute your bacon until almost crisp. Add in your onion and garlic and saute for about 10-12 minutes, scraping up any brown bits as you do. Add in your beans, 8 cups of beef broth and bay leaves and bring to a boil. Reduce to a simmer, uncovered for about 1 1/2 to 2 hours, stirring every so often (beans will be tender). Be sure beans are not sticking, if so add another cup of stock. Choose how thick you want the soup by the stock you add. Some of the beans will break apart and thicken the soup which is how I happen to like it. Pull out the Bay leaves and add in your s&p, sugar, dry mustard, lime zest, lime juice, Tabasco, sherry and chili sauce if using. I allow this to sit for an hour uncovered and off the heat allowing the flavors to deepen. I reheat and serve. This is wonderful the next 2 days! This soup sounds delicious! Perfect for a cold, wintery day! Totally in love with this, pinning to make soon!